The Food and Drug Administration's (FDA) mandatory added sugar labeling policy for packaged foods and beverages, set to take effect between 2020 and 2021, could be a cost-effective way to generate important health gains and cost-savings for both the healthcare system and society in the U.S., according to a new modeling study led by researchers from the Friedman School of Nutrition Science and Policy at Tufts University and the University of Liverpool. The analysis is the first to estimate the potential health and economic impacts of the new label. The study, published today in Circulation, estimates that the FDA's added sugar label could prevent or postpone nearly 1 million cases of cardiometabolic disease, including heart disease, stroke and type 2 diabetes, over a 20-year period. 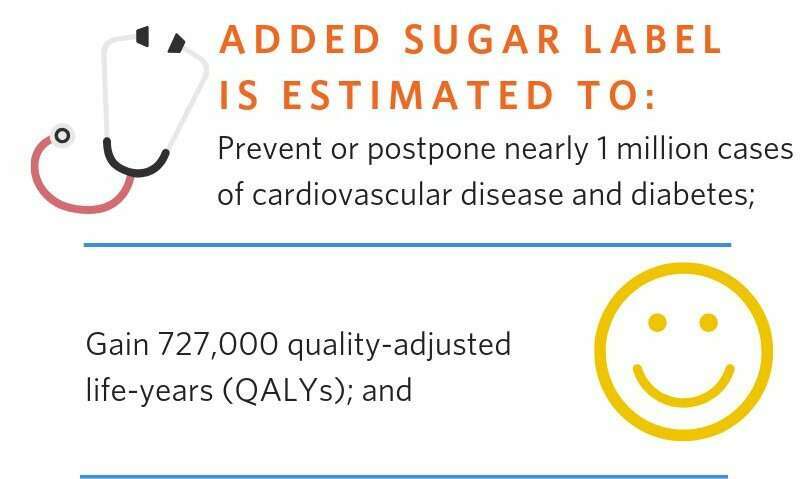 When combined with possible industry reformulations to reduce added sugar content in packaged foods and beverages, the label could prevent or postpone nearly 3 million cases of cardiovascular disease and diabetes over the same time period. Cost-effectiveness of each scenario was evaluated from a healthcare perspective (accounting for policy costs and medical costs) and from a societal perspective (further accounting for informal care costs and lost productivity costs). Both scenarios were estimated to be cost-effective within five years and cost-saving within seven years. Save $31 billion in net healthcare costs and $61.9 billion in societal costs. Policy costs were estimated to be $1.7 billion. Save $57.6 billion in net healthcare costs and $113.2 billion in societal costs. Policy costs, including industry reformulation costs, were estimated to be $4.3 billion. "The added sugar label is an important policy step toward reducing consumption of foods and beverages with high added sugar contents, improving health, and lowering healthcare spending," said Renata Micha, R.D., Ph.D., the study's co-senior and corresponding author and research associate professor at the Friedman School of Nutrition Science and Policy at Tufts University. "These findings have important implications for individuals, policy makers and the food industry alike. Modest industry reformulation would be a powerful way to maximize potential benefits, highlighting industry's critical role in being part of the solution." "Informing consumers about what is in their sugary drinks, cakes, and sweets will help them decide what they want to eat for their health now and later," said Martin O'Flaherty, M.D., Ph.D., co-senior author and professor in epidemiology at the University of Liverpool. "Full implementation of the label before 2021 could help maximize health and economic gains." The researchers used a validated microsimulation model (IMPACT) to estimate the potential health impact, costs, and cost-effectiveness of the FDA's added sugar label based on the two scenarios, which were compared with a "no intervention" baseline scenario over a 20-year timeframe (2018-2037). The model generated a sample representative of the U.S. adult population and utilized data from the two most recent National Health and Nutrition Examination Survey cycles (2011-2014), CDC Wonder, meta-analyses, and other validated sources.